Build acronym lists in a snap! The acronym extraction tool you’ve been waiting for. 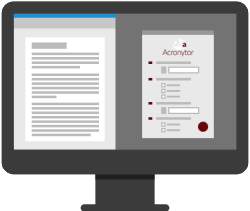 Acronytor scans your document for acronyms by type and can look for the definition from your preferred master list.